The Philippines’ answer to fast food has just landed in America, and obviously people queued in line for eight whole hours for a taste. Jollibee, the Filipino fast food chain with the happiest mascot in the world, has bought its tasty treats to our Western shores. Hungry customers could be seen queuing for hours outside the 34 new chains which have popped up all over the US, primarily in California. The food has been dubbed ‘a cross between McDonald’s and KFC with a side of spaghetti’ – and it’s all very beige. Disregarding the one dimensional colour palette, the menu’s speciality dish is “Chickenjoy” fried chicken, served in the traditional bucket. Did somebody say #Chickenjoy? Come over to my 50th store at #Jollibee Five E-com Center and you're in for a treat! If the bucket of protein doesn’t take your fancy, the side of spaghetti might whet your appetite. With sweet sauce, slices of ham, sausage, and ground beef, topped with cheese the dish may look like a hot mess, but it sounds delicious. 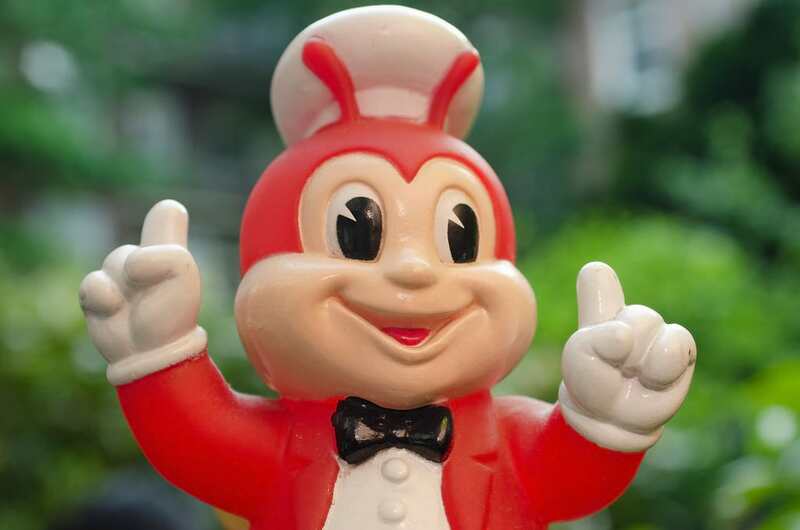 Jollibee, the biggest fast food company in the Phillippines, has begun an intense period of expansion into the US, catering to its cult following within the Filipino community, reports Business Insider. America appears to have welcomed the chain with open arms. It’s probably something to do with the joint’s burgers, which boast an exotic twist. The ‘Amazing Aloha’ is a hamburger with bacon, lettuce, cheese, and a thick pineapple ring topped with honey mustard sauce. Frankly, you had me at hamburger. For the more sophisticated palette, there’s the “fiesta noodles” in a garlic sauce with sautéed pork, shrimp, parsley flakes, and slices of egg. Taking it back down a notch to the pure home comforts, Jollibee also serve corned beef sandwiches. …Not to mention the burger steaks, which come accompanied by the holy trifecta of culinary delights: Mashed potato, gravy and mushrooms. While I am a little confused by the pan-Asian-British-American menu, this restaurant clearly has a monopoly on unusual combo deals. For dessert, you can order the peach-mango pie, which has a crispy pie shell with warm fruit inside, or the halo-halo which sounds like a taste explosion of ube ice cream, creamy custard and jelly. The Jollibee menu is served with a smile too. The company is mapping out key cities in which to expand their 1,090-strong global chain of restaurants, so watch this space. Whatever Jollibee tastes like, the irony is not lost that Americans are so obsessed with fast food, they’d happily queue in the slowest moving lines known to man, just for a moment on the lips. However, if the ChickenJoy stays true to its name, you’ll find me waiting in line for some poultry with a side of unadulterated happiness alongside them.